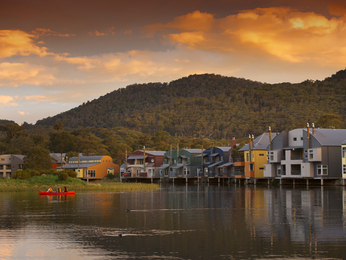 Crackenback is a beautiful gem of a town nestled in the Thredbo Valley, making it an ideal location to explore the Snowy Mountains region all year round. For keen snow bunnies, both Perisher Blue and Thredbo ski resorts are a short drive away, or if you prefer to stay close, explore Lake Crackenback and the nearby mountains. Feel welcome at one of the hotels offered by AccorHotels and our partners in Crackenback. Discover our selection of luxury to budget hotels in Crackenback for your next business trip, family holiday or weekend break.